This hummingbird was very curious about me. It was smaller than the other hummingbirds and lacked their coloration. The pattern of rounded feathers on the neck makes it look like an Anna's hummingbird. I've heard the claim that pelicans hit the water vertically because there's no correction for refraction at the air-water interface at that angle. 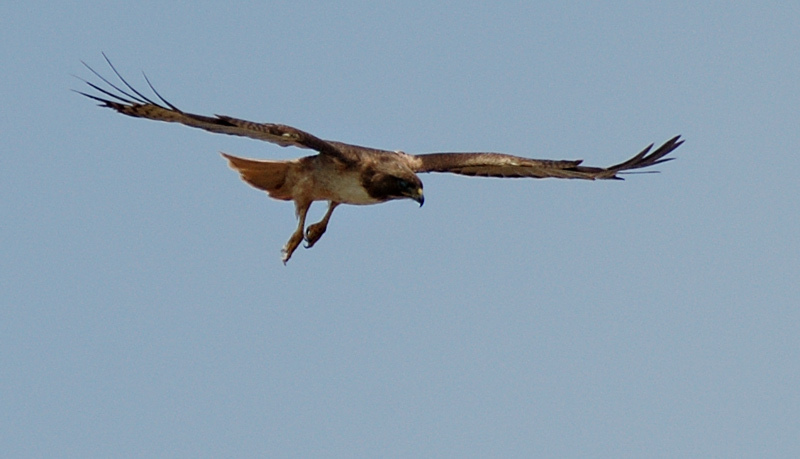 Some of the bird books say that only browns, never whites, dive straight down into the water. This one didn't: it enters at an angle. The impact must be hard on their brains. Or, maybe their brains have an elastic suspension system, like those of woodpeckers. These pelicans were fishing off Refugio Beach. Underwater, I saw a school of big, terrified sardines and a 200-lb sea lion. 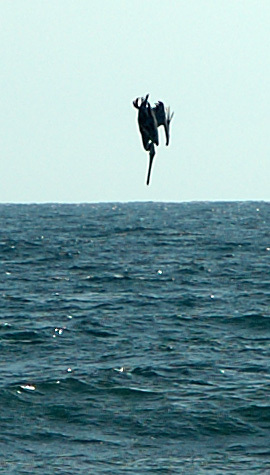 The bird book says that only brown pelicans drop straight into the water. I think that the impact must be hard on their brains. 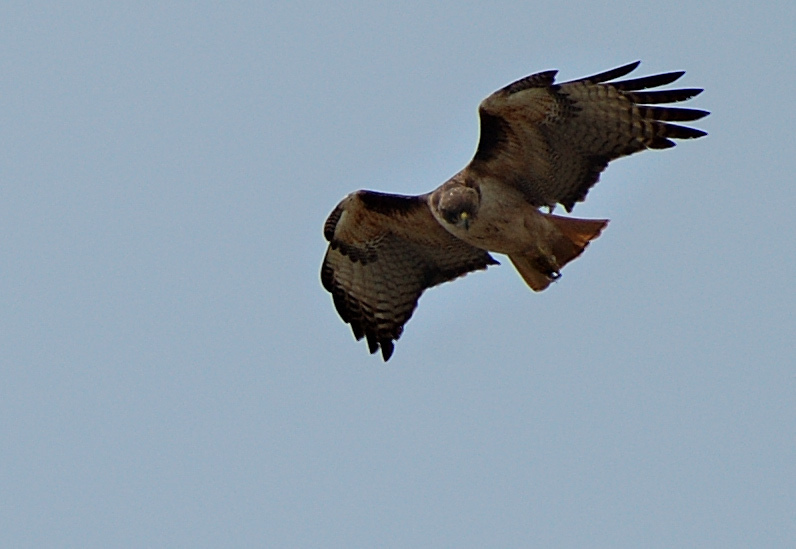 It must be fun to be a hawk, gliding around in space watching the Earth below. Occasionally something is worth a second look. 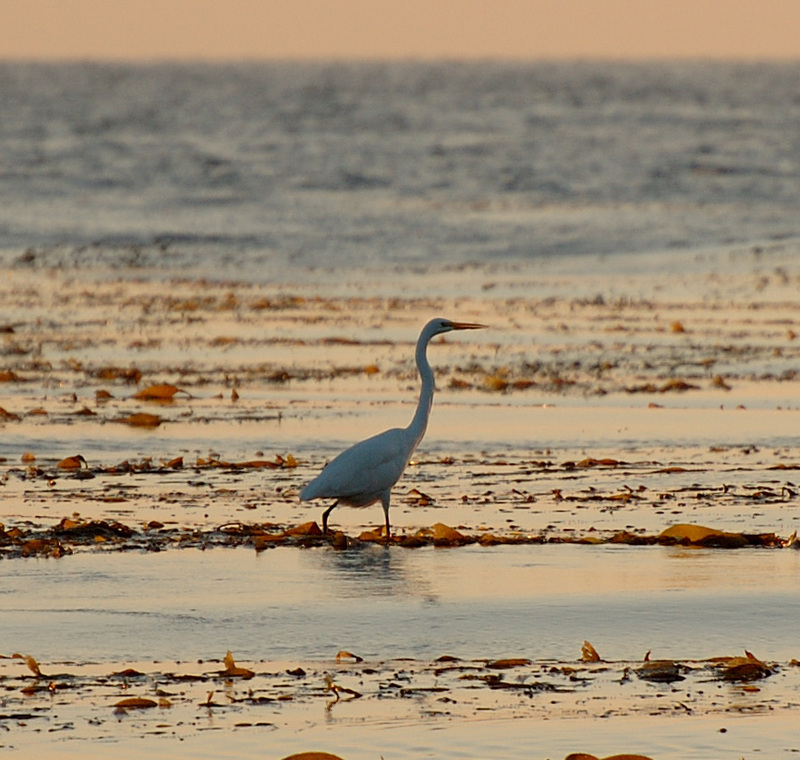 Egrets and sometimes blue herons like to stand on rafts of kelp. The kelp must make fairly mushy footing. It looks like they are waiting for small fish to dart by. Blue Herons seem like they should be river and lake birds, who perhaps enjoy estuaries. They often show up along the beach, though, and fish and socialize as if they were at home there too. 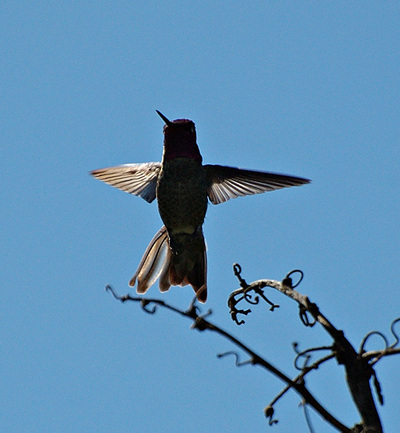 An Anna's Hummingbird takes off from its perch. Those short wings must be good for tight manuevers! 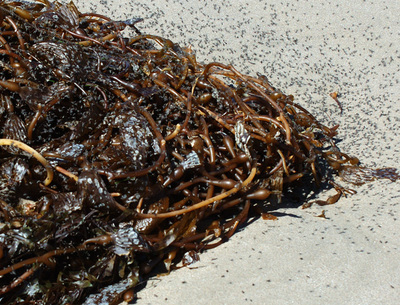 The kelp washed up by the big waves is starting to decay, with the help of lots of insects. These are kelp flies; they seem smaller and quicker than ordinary house flies. 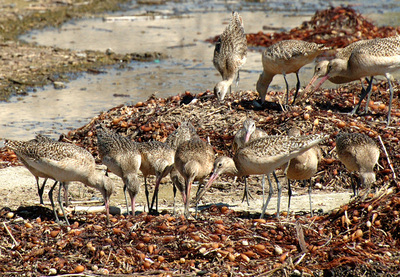 All those invertebrates make lots of tasty eating for the shore birds. I have heard that they prefer copepods to kelp flies, but I dunno.